There’s a reason Sonos is so dominant in this sector – if you don’t mind about the lack of high-res support, it’s hard to fault. For years, Sonos has been synonymous with the concept of multi-room audio, so it’s almost hard to know which came first. At the very least, Sonos spotted a trend long before its competitors – at most, it’s responsible for making the market what it is today. Sonos as a system has two big advantages – breadth of choice and simplicity of use. In the time its rivals have been playing catch-up, Sonos has launched a whole family of products and got onside with a long list of streaming services, not to mention nailing the usability aspect of multi-room. The importance of the latter cannot be overstated, and setting up a Sonos system is one of the most straightforward exercises we’ve undertaken. You’ll need the Sonos app for your iOS or Android device - or, alternatively, download the desktop app which will walk you through the process step-by-step. Once upon a time, users were required to hardwire their first Sonos player directly to their router if possible, or use the Sonos Bridge (£32, now replaced by the £99 Sonos Boost) instead. While this is still recommended for the most robust connection – particularly for speakers spread across a large house, for example – users can now skip this step, as long as their wireless network is strong enough to reach the room (or rooms) containing the speakers. While this helps to make the system more flexible for newcomers, we’d still recommend hardwiring a master speaker if possible, as it’s the only way to take advantage of the proprietary peer-to-peer ‘mesh’ network that makes Sonos so reliable. This basically allows speakers to pass information between one another directly, rather than having to go via the router, guarding against dropouts and playback issues caused by less-than-perfect wi-fi. With so few rivals having implemented a similar set-up, Sonos still has the advantage in this respect. Once your master speaker is connected to your router via ethernet cable, getting your other units onto your network takes seconds. The Sonos app is a large part of the system’s charm. As well as walking you through set-up, it’s where control of your system takes place, enabling you to see what music is playing where, group speakers together and so on. It also offers, by quite a margin, the widest choice of streaming service compatibility of any multi-room system, giving you access to all of your music in one place. Even Spotify is properly integrated into the app, where most rivals force you to use Spotify Connect. On Sonos though, that’s merely an option. Having everything in one place is one of Sonos’s greatest strengths, largely because it enables genuine universal search. Search for an artist, album or track and Sonos will browse through all music services and local sources connected over a home network, such as iTunes libraries and NAS drives. It’s a nice touch, especially when most competitors only search one source at a time. You’re also able to build playlists and on-the-fly queues directly within Sonos, and again from multiple sources. One big gap in Sonos’s offering is its lack of support for hi-res audio, and with systems from the likes of Bluesound offering it, it’s a shame Sonos hasn’t followed suit. If you try to play anything hi-res you’ll get an error message, so it won’t even downsample it. It’s truly out of bounds. There’s a question mark over how important hi-res audio is in the context of a multi-room system consisting of compact wireless speakers, but the option would be nice. Instead, you need to decide whether a vital spec is missing or not. Otherwise, Sonos supports all the main file formats, including MP3, WMA, FLAC (up to 16bit/44.1kHz), WAV, AAC and AIFF, recommending FLAC format for lossless files to ensure the most accurate indexing. Sonos has also recently added Alexa voice control, either through the addition of Amazon Echo devices or the new Sonos One. The latter offers the best, most seamlessly integrated experience, but simply adding the cheaper Echo Dot to an existing Sonos system gives you the option to control the music across your house using your voice. The introduction of Alexa and the constant updating of its app are testament to Sonos’ dedication to endlessly improving, upgrading and evolving its offering, and it makes investment in a Sonos system feel like a safe, long-term bet - though the end of support for the venerable CR100 controller has caused some consternation. Google Assistant and AirPlay 2 are just two features promised for later in 2018. When it comes to performance, each member of the Sonos family offers the same entertaining character that makes the system so listenable, giving a wholly universal sound no matter which speakers you own. Of the specific units on test here, the One is most impressive in its class. It can’t quite match the Audio Pro C5 for outright sound quality, but coming in at £30 cheaper and bundling in Alexa voice control largely makes up for that. In its own right, the One produces a weighty, full-bodied and spacious sound that’s capable of going loud for a speaker so small. Voices are clearly projected, bass is solid, and treble is crisp and clean. It’s a surprisingly sophisticated sound, and one that’s natural and authentic. Should you want the same sonic performance without the voice control, you can currently pick up the Play:1 for £50 less than the One. That general sonic character also carries over to the far larger Play:5, but it’s able to produce a far bigger and bolder sound. This is a weighty performance that can easily fill a room without sacrificing the clarity or openness of the mid-range. It’s effortlessly listenable, with no hard or sharp edges to cause distraction. But since we last looked at the Play:5 in its own right it has had a price rise that takes it to within £100 of the superior-sounding and more fully-featured Bluesound Pulse 2. It’s also facing fresh competition and, like every other multi-room speaker in this class, loses some of its sheen when compared to the superb sound and extraordinary value of the Audio Pro C10. Sonos encourages you to calibrate each speaker using the app’s built-in TruePlay feature, which measures pulses fired out from the drivers. It generally results in better performance, making it a real shame only iOS devices can get in on the action (due to inconsistencies in Android devices’ microphones). There’s also a Loudness switch for each speaker, which is worth experimenting with. Turning it off can result in greater clarity and tighter bass, particularly if the speaker is placed in a corner, but it also reduces weight and scale. Personal preference and set-up specifics will dictate whether Loudness is right for you. 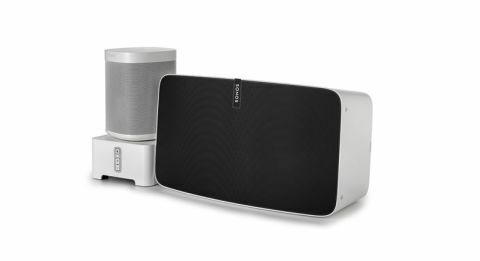 The component in the Sonos range that allows you to integrate your existing hi-fi into the multi-room system is called the Connect (above) and, despite some substantial price increases since it first launched a few years ago, it still holds its own in the class. It lacks a little of the weight of the Bluesound Node 2, but has the edge for timing and dynamics, making it a slightly more engaging and exciting listen. The device has both analogue and digital (optical and coaxial) outputs and, if you’ve got a decent external DAC or a hi-fi with digital inputs, connecting the Connect this way will squeeze a little more quality out of it. There’s a pair of analogue RCA inputs too, which you can use for connecting a source such as a turntable and then send the audio to any Sonos component in the house. When it comes to general usability, the Sonos system is hard to fault. There’s no delay when skipping tracks or source, and the whole experience is smooth and well-integrated. So much so that it puts rivals to shame. You can even pause a track and come back to it a day later - it’ll pick up right where you left off. While we still hope that Sonos has a change of heart and adds hi-res support in the near future, we don’t believe its absence is a deal-breaker. But if you do, you should look at what Bluesound offers. Those looking for a simpler, cheaper and better-sounding alternative to Sonos now have the Audio Pro option, too. But for combining a broad range of very accomplished products with comfortably the most substantial selection of streaming services and the most pleasant and complete user-experience, Sonos remains, for us, the best multi-room option.